Creamy, yet crunchy. Wild rice gives this pilaf a nutty flavor that puts it over the top. I came up with this recipe after eating out a restaurant. The only thing I don't add is the parsley. It doesn't need it. It makes plenty and you can freeze the leftovers for a quick reheat later. Dice your carrots and onions. In large saucepan (preferably non-stick) saute brown rice, wild rice, carrots, and onion in olive oil for 10 minutes or until brown rice is golden. Add broth and bring to a boil. Reduce heat, cover, and simmer for 25 minutes. Stir in white rice, cover, and simmer for another 25 minutes or until liquid is absorbed. Sometimes it takes less time, some times a little more. You can always drizzle in a little more broth or water if the liquid is gone and the rice is not quite finished. If you like it creamier you can add water when it's absorbed and then cook some more, add more water etc like risotto. **You can use all brown rice instead of the white just add it all in the beginning and be sure to watch the liquid as it absorbs it quicker than the white rice. You may need more broth. G'day! I love wild rice Jenny, true! Love the addition of carrot too! 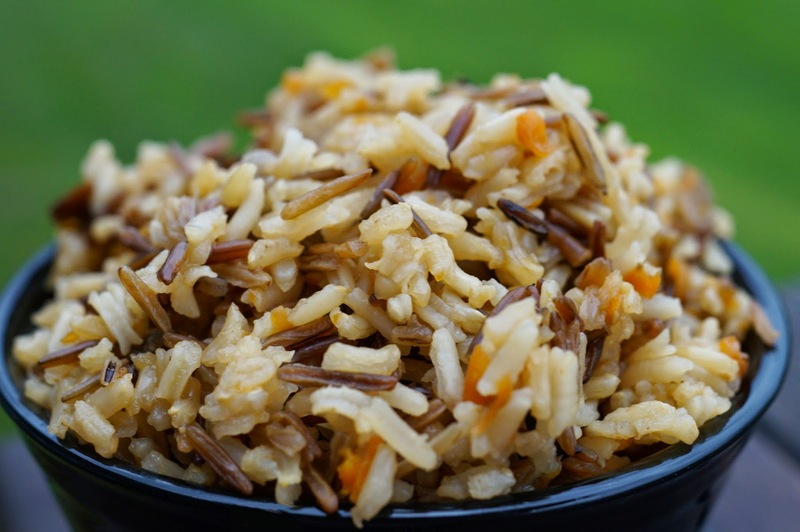 I LOVE the crunch and texture of wild rice.